Well it’s Saturday and with it comes a nice surprise (and no, it’s not me actually posting something.) Red Leader (TFW Supporter, owner of Kapow Toys, and all around nice chap) has splurged a bit on the bay of E and garnished a new Reveal the Shield Turbo Tracks which he has been so kind as to review for us today. A bit of unfortunate news as he reports that it cannot do a flying car mode due to the placement of the wings. 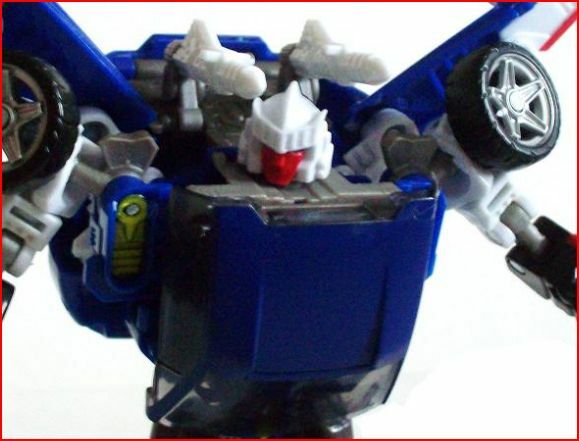 Otherwise this figure looks to be a near identical, more poseable, update to the G1 character. Click on the title to see all of Red Leaders pictures and read his full impressions of the figure! He was one of my first G1's when I was a kid, and made for an outstanding modern figure as well. I am also excited for the upcoming MP release. I have a MOSC United Tracks hanging on my wall…I'm just too afraid to open it, and disturb that awesome metallic blue perfection. Future floor polish will tighten up those feet and legs. I heart this toy. It was my favorite TF of any generation for many years. Yes, I just found, after fondling with him for two days, that the legs are too loose. He topples easily. There's no shame in resurrecting a zombie thread in the Feedback section; it's great to see that older (old-ish?) toys haven't been forgotten and it's a useful thing to get opinions on how these figures have held up over the years. Although I do like this fig, I wish he had better feet. Those darn feet of his are just ugly looking. Very un-Tracks like. I would love to see a third party tackle an upgrade for him (doubt it would ever happen though). They look a bit weird, but I found one of the biggest downsides of this mold's feet (Wheeljack included) is that they're just too loose. Especially after you've owned him for a while. It doesn't take much to get him to topple over. Do you own or have ever seen the G1 Tracks toy's feet? They're pretty flat and long. So actually this RTS update's feet are pretty damn accurate. True, but I don't like the "toe" effect at the end of the feet. I could live with them if they were simply flat and long. They just look off to me. Although I do like this fig, I wish he had better feet. Those darn feet of his are just ugly looking. Very un-Tracks like. Tracks is cool, besides I like the tribal flames and maybe down the road I'm going to paint underneath those wings so that it flows better. & I have a question: what is that little white piece on his right leg for? It's what lets his legs peg together for vehicle mode. one leg did try to be stubborn & not want to extend like the other one but I managed to work it out, so I could get him in bot mode. Picked up this guy today & I'm hella glad that I did. it's a pretty decent figure, there's not much to complain about it that hasn't already been said. I'm happy with it thought. I like this guy alot. I don't dig the super wide chest and puny arms on him as much as Wheeljack. The car mode is nice and I love the headsculpt. Tracks is a very solid figure, if a bit cumbersome. I think he's perfect. Sorry. Tracks was one of my favorites as a kid and for some reason, I never got one, this is the perfect version of the character, better than the Alternators version. his feet aren't that bad.